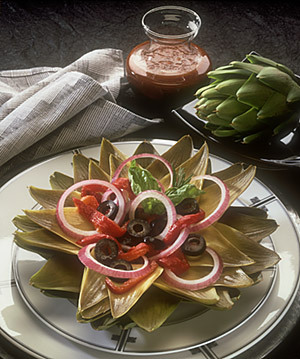 Halve cooked artichokes lengthwise; scoop out center petals and fuzzy centers. Remove outer leaves and reserve to garnish salad; or refrigerate to use for snacks another time. Thinly slice hearts. Cover; set aside. Place whole bell peppers under preheated broiler; broil under high heat until charred on all sides, turning frequently with tongs. Carefully remove from oven with tongs; place in a paper bag for 15 minutes to steam skins. Carefully remove peppers from bag; remove seeds and ribs. Strip off skins; slice peppers into julienne strips. Prepare Dressing: In blender or food processor container, place ¼ of the bell pepper strips, vinegars, garlic, basil, rosemary and sugar. Cover and process until well blended and nearly smooth. 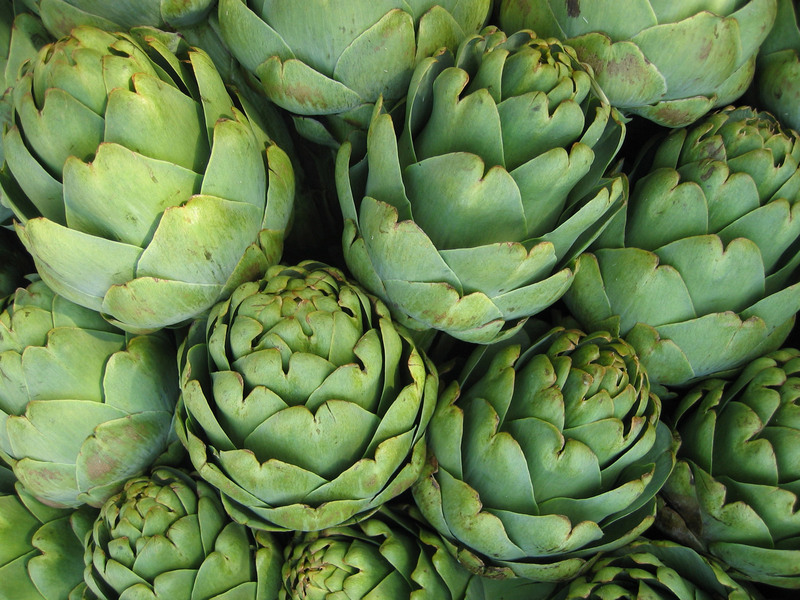 Assemble Salads: Arrange reserved cooked artichoke leaves or lettuce leaves on 8 salad plates. Arrange sliced artichoke hearts, remaining ¾ of the bell pepper strips, red onion and olive slices on artichoke or lettuce leaves. *NOTE: If fresh basil and rosemary are unavailable, substitute 1 teaspoon crushed, dried basil; and ½ teaspoon crushed dried rosemary. Serving Suggestion: Chill dressing: Arrange salad; cover and refrigerate up to 4 hours ahead. Spoon dressing over salads just before serving. Nutrients Per Serving: Calories 88; Protein 4.7 g; Carbohydrate 19 g; Fat 1 g; Calories from fat 12%; Calories from saturated fat 2%; Sodium 189 g; Cholesterol 0 mg; Dietary fiber 5 g.